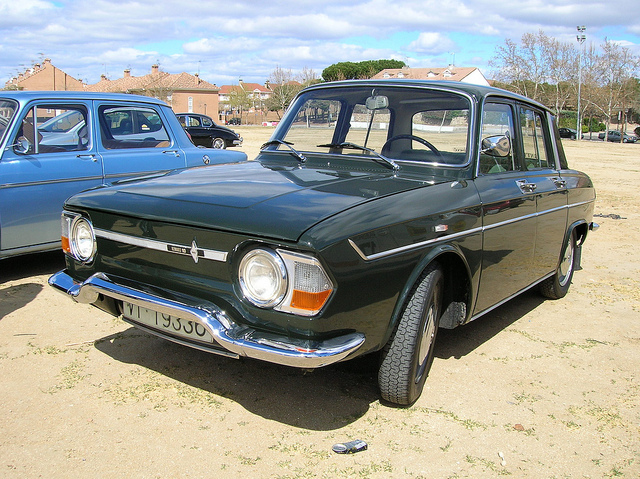 Of all the vehicles we had in the family between 1968 and 1990, none was more unique and special than “The Renault.” The Renault was technically a 1969 Renault R10 four-door sedan with an 1100cc water-cooled engine in the back, manual transmission, and luggage storage in the front under the bonnet. It had a crank to start it if the starter failed, a spare tire housed in a little mouth under the front bumper, and three-bolt wheels. The engine on the stand was none other than the heart of the R10. I learned to drive on The Renault. Although we had four or five cars at the time, The Renault was the only one with a manual transmission, and Mom decided that I needed to learn how to drive stick. Dad would take me out in that car, but before we left he always made sure he had his tools, fire gear, and other heavy stuff up front under the bonnet. What I didn’t understand at the time was that the R10, with its rear engine hanging over the back axle and virtually nothing up front, would handle like a fishing boat without additional weight over the front axles. Dad would load the car so it felt “normal” to me. Our Renault R10 was the color of the of the one out of shot to the left. “What? What if we roll it?” I asked, knowing that the ditch was quite deep and steep. “We’ll get out and roll it back on its top,” he answered. At that point he explained how to take the ditch, and I proceeded into the canyon (to the R10) without incident. He then taught me how to hill climb on wet grass to ease the car out of the trench. “WHAT?! ?” What will we do if I blow up the engine?” It was getting late, there were no mobile phones, and we were about two miles from home. “I’ve got spares. And we’ll walk,” Dad calmly replied. When he first picked up The Renault, he located the only other R10 in the state and tore it down for parts, and what I didn’t know until then was the Renault Dauphine that Brian and I stripped when we were kids had similar power train parts, too. Those pieces were in the garage. Dad had installed a racing tachometer so using that as a reference, I wound the little 48hp engine up to 11,000 rpm to the point where it started burbling. I held it for a few seconds until Dad told me to ease it back down. “There. Now don’t do that,” Dad said, looking out the front window with a big smile on his face. Aside from the French power train, the car itself was quite quirky. When I took the mandatory driver’s education course in high school, I frustrated Mr. Meyer to no end. He’d say things like the “headlight switch on all cars is located on the dash to the left of or on a lever attached to the steering column.” At which point, I’d calmly raise my had and say, “not on my car. To turn on the lights you need to flip a switch under the steering column, pull a lever and toggle another switch to get the lights to come on.” And when he talked about the windshield wipers and how to get the cleaning fluid to spray onto the windshield, again, my car was different — it didn’t have a powered sprayer; I had to pump it. Oh, and the signal lever was on the wrong side, and my car was the only one that didn’t require a starter. Silence. “Oh,” he replied. Mr. Meyer didn’t call on me anymore. Dad loved taking The Renault out during blizzards. He’d travel down seemingly impassable streets and motor around stuck 4WD pickups with ease. We’d laugh at those truck owners as they’d scowl at The Renault, a car nearly two decades old and a fraction of the cost, pass their helpless all-wheel power beasts with the prowess of two-wheel drive and 48hp. What those folks did not know is that the entire underbody of the car was covered with a belly pan. The pans along with reduced weight in the front, the engine in the back, and very narrow and tall tires, turned The Renault into a powered toboggan. We didn’t plow through snow during blizzards — we slid over it. As long as we kept the momentum up, physics (and smart driving) would take care of the rest. The Renault in all its forms lived wonderful life. It started in an R10, became the heart of a street-legal homemade dune buggy, and moved on to become the soul of Dad’s perfect garden tractor. And there it sits, quietly, on an engine stand in the garage. When it came to retire the Chevrolet Lacetti, Richard Hammond on Top Gear did a piece on what cars come to mean to families. Cars often do become much more than machines; they develop a personality and become something more. The Renault was, no is like that; it has never given up and has been there for every challenge and idea that Dad cooked up for it. And there it is, on an engine stand, ready for the next adventure. That little engine — The Renault — to me is everything Dad. Every day was an adventure.